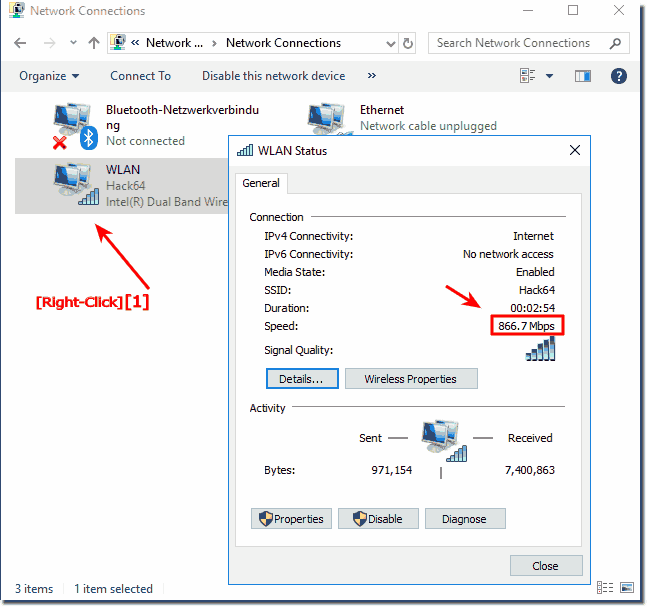 To see the WLAN or WiFi connection speed under Windows 10, there is an easy way! The pictures (screenshots) are made under Windows-10, but the solution is also suitable for Windows 8.1 and 7. 1.) ... Displaying the WLAN speed under Windows! 2.) ... Measure the WLAN speed! 1.) Displaying the WLAN speed under Windows! Please start the Control Panel in Windows 10 in example Windows Logo + X option Control Panel. If you have created a system desktop shortcut you can use it as well. (Image-1) See the WiFi speed under Windows 10! And now with a double click on the Active WiFi (WLAN) connection open to see the characteristics of the connection. Here it is 866 Mbit per second a pretty good value. The connection speed of WLAN can also fluctuate very much, possible causes are interference fields near the router or in the vicinity of the PC or notebook which can also be caused by a mobile phone (smartphone / iPhone). By right-clicking on the network adapter, you can disable Disabled Connections. (Image-2) Wlan or WiFi speed under Windows 10! 2.) Measure the WLAN speed! There are many benchmark test or special software or you can also do an internet speed test. In general, if you have multiple machines on the network, you can simply copy the files between two computers to see the speed during data transfer. There is also special software for measuring, but it is generally absolutely sufficient to make a copy operation in the network. Please note that all components in the network are responsible here (WiFi adapter, FritzBox, router, network cable, ...). See: ► Slow data transfer in the home network on the notebook, laptop, or PC? ►Identify network problems with the command prompt!